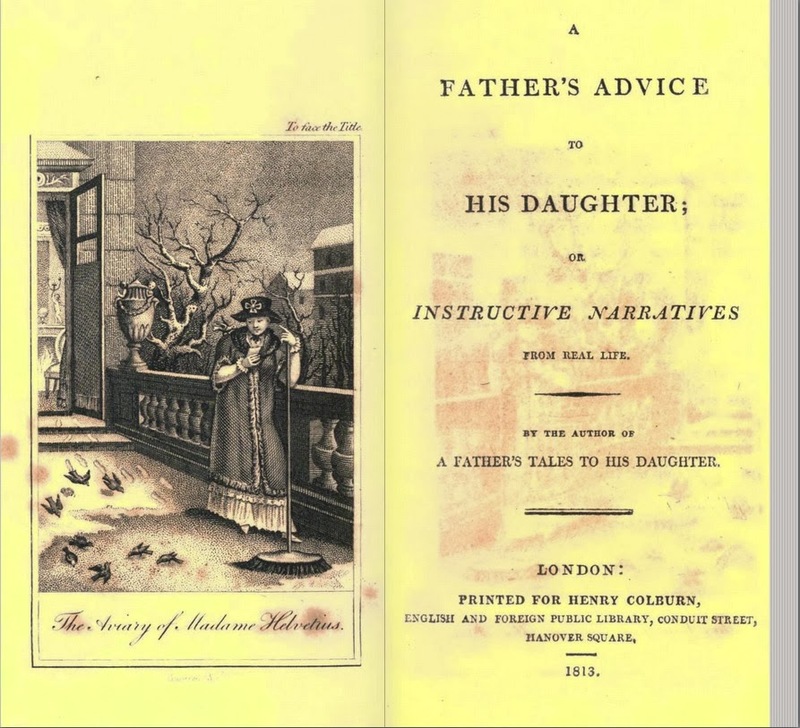 According to Antoine Guillois, the tale is particularly fitting since Madame Helvétius was as fond of children as she was of animals. Her entourage included his grandmother Eulalie Roucher, Ambroise Firmin-Didot, Amithe Cabalis and Elisa de Condorcet, as well as the two daughters of her faithful servant Marin. The children were allowed into her room and aviaries as well as having their own gardens. Madame gave the delicate little Eulalie her own youthful nickname "Minette". She apparently used to recit La Fontaine's fables to them regularly at their dinner time. The tale is also if interest for its memories of the terrible winter of 1788. THE AVIARY OF MADAME HELVETIUS. MADAME Helvetius, the amiable wife of the celebrated writer of that name, who has described with so much eloquence the advantages to be derived from the mind, and the errors to which it is liable ; a lady whose graces and rare qualities inspired her husband with the sentiments of his charming poem entitled " Happiness," had a remarkable fondness for birds. She knew every genus and every species of them, and collected them at her beautiful house at Auteuil in a large elegant aviary, which was only shut during the night in order to preserve her numerous family from noxious animals. In the morning, as soon as she had given to each of them the food that was best suited to it, she opened the doors of their prison, and left them to the enjoyment of dispersing themselves about the country. Very often a small part of them only returned in the evening. In fine weather particularly the joyful flock finding sufficient nourishment out of doors, forgot the asylum where the most solicitous attention supplied an abundance equal to or beyond what they found elsewhere. But an insect just ready to fly, the muddy water of a pool, and the slightest shelter under the foliage of a tree or shrub, were preferred to the long millet straw, to the fountains of clear water, and to the nests of moss and down, with which the aviary was furnished. So true it is that nothing can compensate the charms of liberty and independence! But from the time the frosts began, almost all the fugitives returned to enjoy the comforts of hospitality. It even often happened that these little emigrants brought with them a great number of the birds of the neighbourhood, who sought like them to avoid the horrors of cold and hunger ; for everything yields to the imperious law of necessity. Madame Helvetius never parted from her numerous and dear guests but with regret ; but the celebrity of her name, her natural graces, and the charms of her society, often recalled her to the capital, whither she usually went towards the month of January. Madame Helvetius, after having taken care that her aviary at Auteuil did not suffer in any way from so disastrous a winter, employed herself at Paris in relieving the distressed in the part of the town that she inhabited. Her compassion extended to every suffering being around her. From the windows of her apartment which looked upon a long terrace, she often saw a great number of sparrows, who at night took refuge in the stables of her hotel, and during the day sought every where in vain for some food. Exposing herself without regard to the rigours of the cold, she swept the snow from a part of the terrace, and never failed in the morning to scatter there seeds of all kinds, on which an immense number of birds immediately threw themselves, approaching her without fear, and even coming into her room. One day as she was thus indulging herself in the pleasure of feeding all the sparrows in her neighbourhood, one amongst them came and perched upon her head, then descended to her shoulder, and at last came and nestled in her bosom. Madame Helvetius thought at first that this boldness was occasioned by the cold with which the bird seemed to be overcome. Her first care was to warm it in her hands, and then to revive it by the fire ; but perceiving that it perched familiarly upon her finger, reclined upon her neck, and made caressing gestures by beating its wings; Madame Helvetius no longer doubted that it was a tame sparrow that had flown from some neighbouring house, and which was attracted, like so many others, by the seeds scattered upon the terrace. After having shown this refugee every attention that its gentleness and familiarity inspired, Madame Helvetius would not make it repay them with its liberty: she therefore opened her window, and said to the bird : " If you belong to any body in this part of the town, they must be uneasy as to your fate. Fly instantly to satisfy those who regret you. If you cannot find your asylum again, return to me, poor little wanderer, oh ! return again to warm yourself in my bosom !' At these words she gave the sparrow a kiss, and it then flew away and es- caped from her sight.
" By thee the younglings of the nest are fed. And o'er all nature are thy bounties shed." " Some worthy persons in your neighbourhood languish in distress, will you do less for them than for the numerous family which you are seen to succour every morning ?" "Undoubtedly not !" exclaimed Madame Helvetius, giving herself up to her emotion : " how can one resist so affecting an appeal, or refuse sa charming a messenger ?" She flew immediately to her secretary, took from it a note for fifty pounds, and put it into the little bag, instead of that which it had contained; then kissing the sparrow several times for its commission, went out upon the terrace, and let it take its flight. She wished to follow it with her eyes, and, by observing the direction in which it flew, to discover on which side the unfortunate persons lived whom she had assisted: but the bird passing rapidly over the trees of the garden, concealed itself from the observation of its benefactress, and left her full of the most gratifying reflections. What above all things engaged the imagination of Madame Helvetius, was to learn how the faithful sparrow had been taught to fulfil such a commission. " By what means,"' she said to herself, " can it have been accomplished, to make him direct his flight towards my apartment, to hit upon the moment at which I gave food to its companions in misfortune, to come and rest upon my head; in a word, to distinguish and choose me for the consoler of suffering beings, for whom it is the captivating mediator?. ...The more I think upon it, the more I am at a loss." Several days passed in which Madame Helvetius thought incessantly on this singular adventure; but she forbore from any mention of it, as that would have been to reveal her good works, and she knew by experience that secrecy doubles the value of a benefit. Some- times also in the liveliness of her brilliant imagination, and from her extensive knowledge of the world, she feared that she might have been made the dupe of intrigue or avarice; as amongst the interesting beings who have a claim upon our compassion, so many impostors obtrude themselves who abuse our confidence !
" You have saved an estimable artist and his numerous family; the fifty pounds will be remitted to you, as soon as the return of spring and the labour of our hands will allow us to acquit ourselves of the obligation." '* I supposed I had made a gift: if it is but a loan, the happiness of having been useful to you will make me your debtor." From that moment the tame sparrow reappeared no more. Madame Helvetius vainly supposed she recognised it in each one of its species whom her kindness drew together ; but as soon as she would have put her hand on one of them, the whole flock flew away with a rapid wing, and saved themselves as from before a bird of prey. The frosts at length ceased ; and the snow yielding to the rays of the sun, which acquired more power every day, announced that the appearance of the spring would not be long delayed. Madame Helvetius now scattered her abundance of seeds in vain, as she no longer attracted more than a small number of her dear guests: the others finding a sufficient supply for their wants, and already engaged in preparing the nests which were to contain their first broods, came but seldom upon the terrace. They even seemed to become more wild in proportion as the fine weather returned. Madame Helvetius felt a secret mortification at this forgetfulness, at this ingratitude : "But can one," she remarked to herself, " impute to birds as a fault, what one meets with every moment amongst mankind?" On the first of May this lady returned to her house at Auteuil, in order to repair the disasters of the cruel winter which was just over. She was eager above everything to make good the injuries that the frosts had occasioned in her aviary. 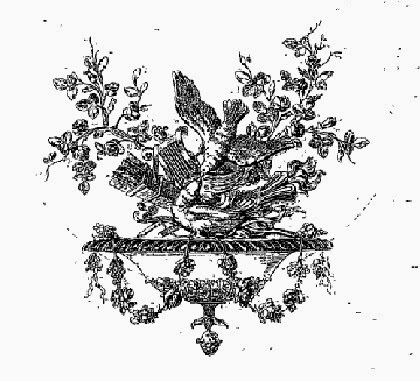 There, every time that she cast a look on the several sparrows which made a part of her various collection, they recalled to her mind the engaging mediator between her and the unknown family ; and although this species of bird may not be remarkable either for the variety of its song, or the splendour of its plumage, Madame Helvetius felt a predilection, she could not resist, for every sparrow that she saw, for which the generosity of her heart fully accounted. Towards the middle of the summer she was obliged to leave her rural occupations, as some business made it necessary for her to go to Paris. A few days after her arrival, as she was enjoying the morning air upon the terrace, she perceived the faithful sparrow, with the same little bag hanging from its neck, flying about here and there, seeming no longer to know her. It was in vain that she called to it, threw it some seeds, and made a thousand caressing motions to it: the sparrow passed and re-passed over her head, expressing at once a fear and a desire of resting there. Madame Helvetius then supposed that it must be the change in her dress which occasioned this distrust. "We lose no time in acquitting ourselves of the sum of money that you have condescended to lend us ; but not of our gratitude, which will remain for ever engraven on our hearts." Madame Helvetius was at first tempted to send back the fifty pounds ; but she reflected that this might only deprive these amiable unknown persons of the sweet enjoyment of having acquitted themselves of a sacred debt. Being desirous to accustom the intelligent messenger to know her in her summer dress, she put off her mantle and pelisse, and appeared in a white morning dress, without a cap. 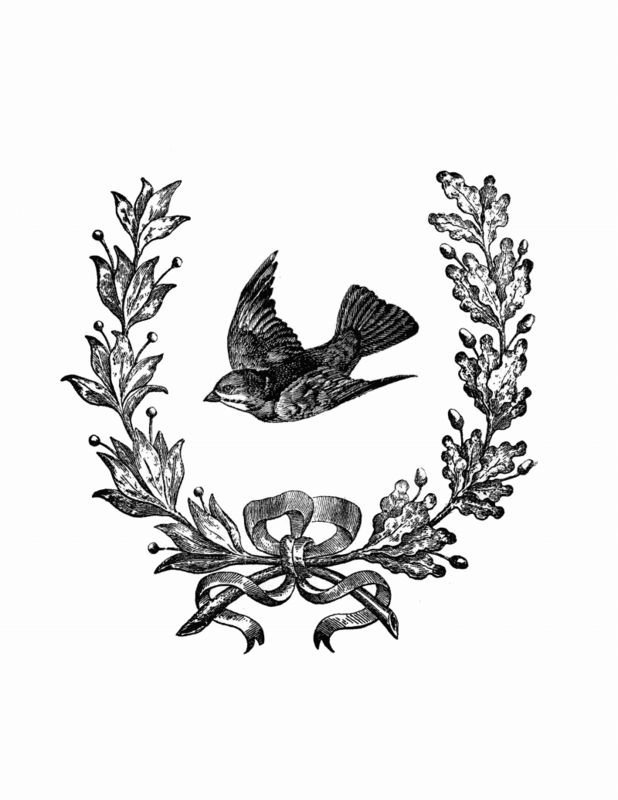 The sparrow was soon reconciled to this new appearance ; and as his intelligence, and the services that he had been instrumental in, often procured him his liberty, he came regularly every morning to Madame Helvetius's terrace. If she did not appear in a short time, he struck with his bill against her window, in order, if it may be so expressed, not to return without having paid his homage to his amiable benefactress. Not many days after, on a Sunday, Madame Helvetius, having resorted to her favourite walk the botanic garden, after walking about some time sat down, in company with many persons of distinction who formed her usual society. She was earnestly engaged in a delightful conversation, when all at once the faithful sparrow, which had been so often a messenger to her, came out from under the silk handkerchief of a young woman sitting opposite to her upon a bank of turf, and, lighting upon Madame Helvetius, testified by his caresses that he knew her again. "It is my pretty messenger", she exclaimed, kissing it repeatedly : " but how could it come into this public garden, in the midst of so much company ?" " Let me beg you will excuse it, madam," said a young girl of ten or twelve years old as she approached Madame Helvetius, "it is my sister's favourite." " And who is your sister, my little friend ?'" " That young woman dressed in white, that you see there by my father and mother: this bird I assure you belongs to her ; she would not part with it for all the money in the world." When she had done speaking, she pointed to a young woman of sixteen or seventeen years old of an interesting figure, who colour-ing with joy and surprise said to her parents, " It is she! Yes, it is she herself." At last the young Elizabeth, for such was the name of this unknown person, recovering her voice, informed Madame Helvetius that she was the eldest daughter of a carver of the name of Valmont ; that her father, having been attacked with a lingering illness, had been unable to work, which had reduced them to great distress ; and as the labour of his children could not effectually relieve them they being as yet in general quite young ; the name of Madame Helvetius had inspired her with the happy idea of procuring that assistance for her father by the means she had adopted, that his spirit would not suffer them to beg. That in a word it was she,who unknown to her parents had made the experiment of sending her dear sparrow, whose intelligence had seconded her views beyond what she could have hoped.
" But by what means, let me understand," said Madame Helvetius, " did you accomplish the directing our mutual interpreter to me ?" " Oh! madam, it has cost me great pains and great distress !" replied the young Elizabeth, caressing the sparrow which was upon her breast. " I have often been obliged to expose it to the severity of the cold, I have even been obliged to have the cruelty to keep it without food for whole days, in order that it might be attracted, like all the other birds, by the food that you threw out to them, that it might be accustomed to see you, and to approach you. I observed all that was going forward from the window of my room, which looks upon your garden. Sometimes the poor little creature flew about the neighbourhood quite frightened, and only returned after a long time allured by the sound of my voice. Sometimes it was pursued by the wild sparrows, and returned wounded from their pecking it, and with its wings torn. At last I saw it one day flying about you, and lighting upon your head. The next day, having again had the resolution to deprive it of food, I seized the moment at which you threw out your benefaction of seeds upon the terrace, and risked the little bag which contained my first note. You know what followed." Madame Helvetius could not, any more than those who surrounded her, suppress the most lively emotion. This interesting detail made her feelingly alive to the tender ingenuity of filial piety. She pressed the young Elizabeth several times in her arms, thanking her for having selected her to assist in saving her estimable family, and entreating her not to let the dear sparrow lose the habit of coming often to see her. And in relating this anecdote she never failed to repeat, what I here repeat to you, my daughter, as my first advice. That it is better to pardon one guilty person than to condemn an innocent one. That even the fear of encouraging vice, or of favouring imposture, ought never to make us lose an opportunity of assisting honest and respectable poverty.